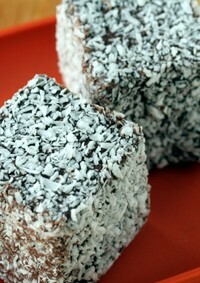 The hardest of all foods to photograph, I’ve learned, are chocolate-covered marshmallows. 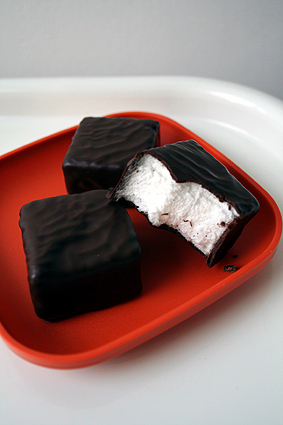 The bright, fluffy, vanilla-flecked cubes of sweet, airy marshmallow in contrast to the thin, intensely-flavored coating of bittersweet chocolate certainly presents a challenge. 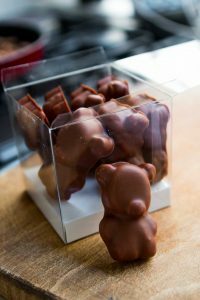 I futzed around a bit, trying to figure out how to show the lofty-white cubes in juxtaposition to the coating of pure, dark chocolate. They’re such diverse colors and textures that I tried several variations and lighting situations, until I decided that they’d looked best with a piece broked off. So I took a bite out of one. Then I took another bite. …and ate the whole pack. Thank goodness you took that bite! They look amazing! You greedy man! But seriously, how do manage to maintain your slim and attractive figure (and your own teeth?) with all the chocolate marshmallows and other sweeties you stuff – daily?? What, may one ask, is the secret? Just found your site and have to say, they are probably hard to photograph when they’re moving so quickly from plate to mouth! LOL! found this in German wikipedia! We pigged out on these and the are so sick! Those look delish! You should come into the restaurant I’m cooking at (Guy Savoy) and try their marshmellows. They dissolve instantly leaving an ethereal essence on the tongue. I often find myself sneaking into the pastry kitchen and stealing them when I can. Yess, showing innards is the way to go! :D That’s how I like to show food at least, hehehe. And of course it would only make sense for you to eat the whole pack in a state of clouded-by-marshmallow-mind if they’re so delicious. I read their book ‘Culinary Artistry’ cover to cover while I was in cooking school in Chantilly! I’ve know people who say that they use the book as a reference book, but I’m thinking that they missed SO much by not reading it. Can’t wait to Amazon the new one. David, you need to do a book of food pictures! You take such wonderfully inspiring photos!! And, pair the pictures with your writing!!! Please oh please oh pleeeaaaasssseeee!!!!! Hmmmm…interesting. 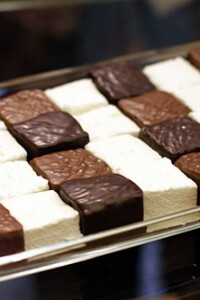 I fell victim to Marcolini’s chocolate chip marshmallows in NYC, mainly because they looked so exterestial (the price was too) in their chic black box. They must have been from France because by the time I got them home they were in sorry shape and tasted even worse. Disappointing since everything else I’ve had of his was divine. These sound way better. i’ve come to realise that dessrt sauces, especially in a combination with ice cream and roast peaches, are the most dedly thing to take pictures of. your window of opportunity is literally 2 seconds… whereas your marshmallows look like they were behaving themselves?? The look delicious, by the way, I am not a fan of the foamy stuff because most of them taste like straight out of a chemistry kit, but I would definitely delve into these!